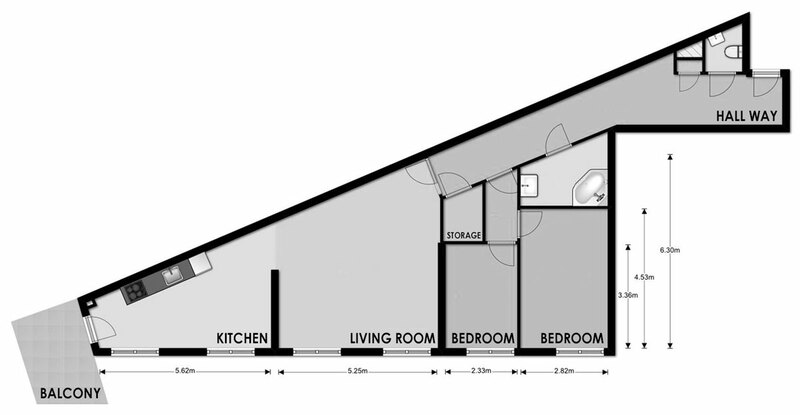 This apartment is located in the narrow point of a building built on a not so friendly plot. The narrow point has been split in half on the diagonal in order to create two identical apartments on each of the lower floors and one big one on the top floor. While this kind of “sharp” shaped constructions are no novelty, their angles don’t do anything to help them in any way, shape or form. To me, however, this was a tease. 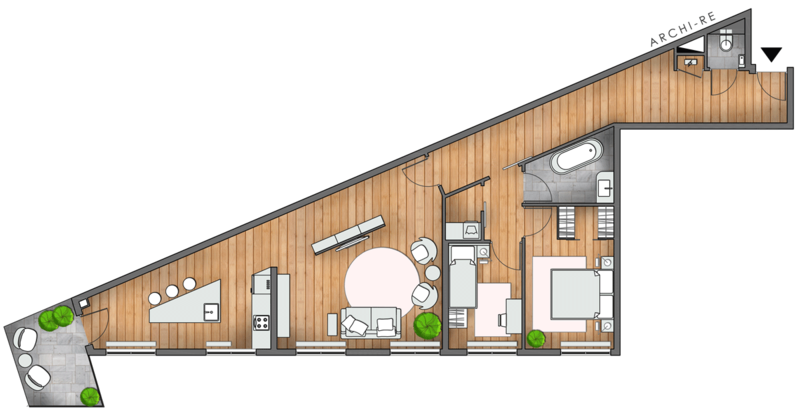 A floor plan bound to come with headaches, but, oh, so irresistible. • Firstly, the long corridor is a major turn off. It is a wasted space, unpractical and impossible to furnish. • The toilet location at the entrance makes for long philosophical trips pondering over the immortality of the soul. You could even go castle inspired and cover the walls with portraits of people you want to debate that with. Not sure how you’ll fell about it at night when half asleep but hey, you’ll definitely make an impact when hosting a party. • Accessing the door to the bathroom from the hall way might seem friendly towards guest. I, however, doubt its friendlies while trying to get as fast as possible from the bathroom to the bedroom, and bumping into guests on their way between the living room and the toilet. I would think that as the two bedrooms have their own corridor, the access to the bathroom would be done from the same private space. The same goes for the storage/laundry room. • Part of the living room gets lost as a transit space. It is rather unfortunate, however that is the nature of this type of layout. You’re always going to see somebody moving between spaces. I would have liked to position the bedroom where the kitchen is. That would have given the terrace a special role as a private space. It would have also allowed for smaller transit areas and less circulated due to the privacy of the function. That idea fell rather fast though, as placing the bedroom in the corner of the building means taking the risk of “howling” nights when the wind blows with a vengeance. The shape of the room as well as the two structural walls splitting the apartment in three didn’t help either. So instead, I decided to see how I can best use the existing layout. • I moved the access to the bathroom and the storage/laundry room in the private corridor, away from guest interaction. I changed the access door to the private corridor into a sliding one in order to prevent nose bleeds and unwanted conflicts from interacting with it. And as an added bonus, this made the space even more efficient for philosophical pondering. You’re welcome! • I decided to emphasize and use the transit space and created a divider wall which can house the TV on one side and some shelving on the other one. Nice place to keep your books and select one on the way to the balcony for a nice summer day. This layout also means that people using the day area will not have the feeling of insecurity created by not seeing who passes behind them as there is now a full view of the transit area. • The shape of the kitchen makes it “interesting” to place an actual table. Sure you can place a two person table, but in my opinion that is not taking advantage of what the space has to offer. I would thus create custom furniture that allows for the flow of the transit space and increases the effect of the two large windows in the room. • As I know and have already stated multiple times, people use and need space in different ways. I have, thus, added below a few options for the living room space.